An enantioselective synthesis of (–)-stemoamide is presented. Noyori’s ruthenium complex catalyzed asymmetric transfer hydrogenation of an alkynone delivered the (S)-C8 stereogenic center in 97.7% ee. An iron(III) chloride promoted and bioinspired N-iminium ion cyclization afforded a 3:1 ratio of two diastereomers in favor of the cis-isomer. The diastereomeric ratio was enriched to 50:1 by a silver-catalyzed cycloisomerization. 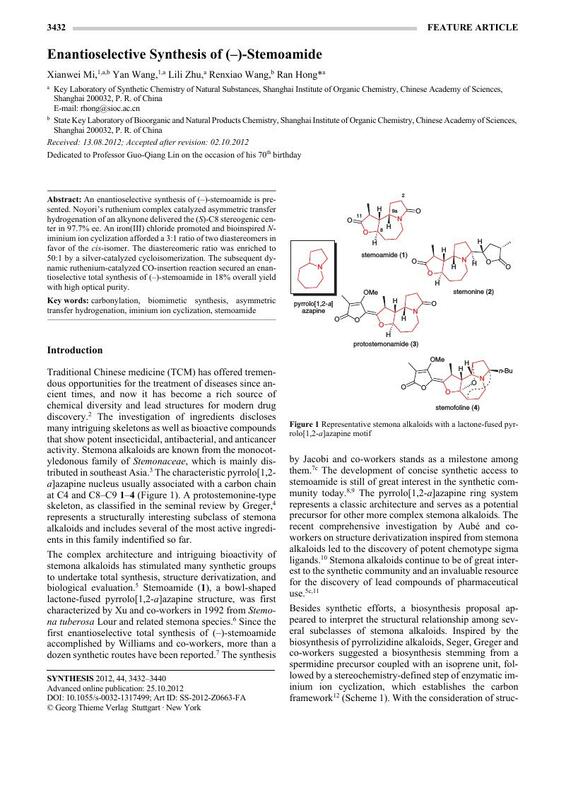 The subsequent dynamic ruthenium-catalyzed CO-insertion reaction secured an enantioselective total synthesis of (–)-stemoamide in 18% overall yield with high optical purity. 1 These authors (X. Mi and Y. Wang) contributed equally to this work. 23 After the cycloisomerization, 13a, cis-14a, and trans-14b were determined as a ratio of 58:16:25, and 13a could be isolated in 53% yield. Its spectra are identical with our previous reported data as indicated in ref. 8c. 24c To interpret the unexpected epimerization associated with Ru-catalyzed carbonylation in our synthesis, an alternative mechanism was proposed, see ref. 8c. 25 Correct nomenclature for cyclized products 14 and 15. A consistent numbering scheme is used for convenience in Figure 1, Scheme 5, and the text.